Summer is in full swing, and as temperatures rise and the sun shines brighter, It’s important to remember to protect our skin from harmful UV rays. As you plan this season’s schedule of fun in the sun, remember that it comes at a price if you’re not properly protected. There are many misconceptions about sun damage and skin protection, so we’ve gathered some tips and useful facts to help you best prepare for summer vacation, while still enjoying some Vitamin D.
What are the dangers? – There is often confusion surrounding when sun damage occurs and how it appears on your skin. The Skin Cancer Foundation cites that 90 percent of visible changes to the skin, commonly attributed to natural aging, are actually from sun damage. Another common misconception is that most of your sun exposure will occur by the time you’re 18. Therefore, most people believe regular protection after your teens is no longer necessary. In reality, by 18 years old you’ve only experienced 23 percent of your lifetime sun exposure, making protection after your teens a necessity. Most skin cancers are also related to sun exposure and damage, which are completely preventable. Ultraviolent (UV) rays are also commonly known to result in premature aging of your skin. So, what’s the bottom line? It’s never too late (or too early) to start protecting your skin from the sun. Using sun protection products as often as possible is the best way to slow signs of aging and prevent skin cancer. Use sunscreen every day (even when it’s cloudy) – The best way to prevent sun damage and skin cancer is by wearing SPF every single day, no exceptions. Even on a cloudy day, 80 percent of UV rays reach your skin and can cause damage. On an everyday basis, dermatologists agree that SPF 30 is sufficient. On a day spent mostly outside, with sun and sweat, it’s important to up your game. We recommend a product with an SPF 50+, protecting even the fairest skin from sun damage and sunspots. Remember to reapply every two hours to maintain protection all day. Know the signs – By the time your skin is red, burned, or blistered, sun damage has already occurred. Using after-sun remedies can reduce redness, soothe irritation, and prevent any further damage from occurring. We recommend a product with aloe vera, or aloe vera in its pure form, as It will speed up the recovery time from your burn, repairing the damaged cells and promoting the generation of new cells. Furthermore, any oddly shaped discoloration or moles should be checked by your dermatologist as soon as possible. Planning and prevention – Keep in mind when planning outdoor activities that the sun’s rays are strongest between 10 a.m. and 2 p.m., and It’s critical to apply protection all over. 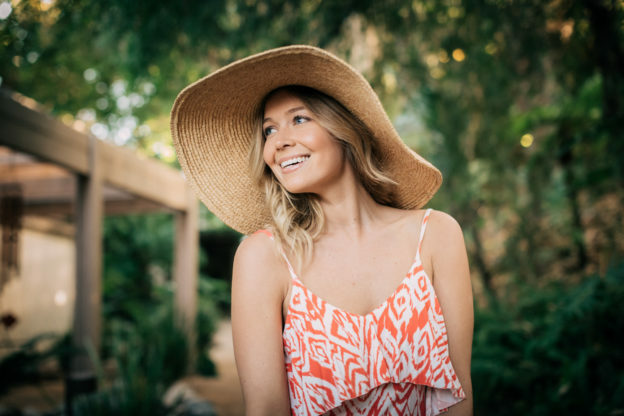 Products that double as coverage for face and body are great for 2-in-1 protection, particularly when planning to be outdoors during peak hours of UV exposure. Finally, for anyone who is extremely sensitive to the sun, but still wants to enjoy the outdoors, consider sun protective clothing. Look for clothing certified as having an Ultraviolent Protection Factor of 15 or higher to achieve ultimate protection. Diligent sun protection and organic products go hand-in-hand in providing the ultimate care for your skin. Coola Suncare offers the perfect solution with natural, organic, and sustainable sunscreen that actually works. Their eco-conscious formulas ensure that your face is well-protected without harsh chemicals and irritants. Interested in learning more? Coola Suncare will be at Glen Ivy on Saturday, August 25, from 8-11:30 a.m. to share their amazing, organic suncare products.